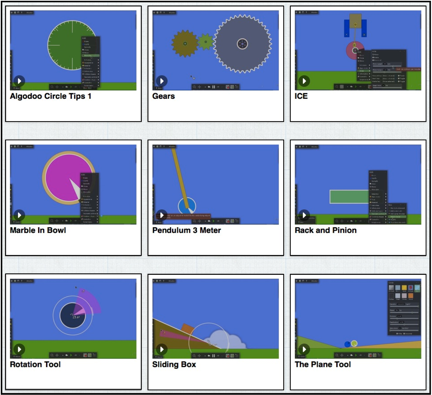 In the last post I introduced Algodoo, the physics sandbox for the PC, Mac, and iPad. I made a point of stressing the importance of working through the tutorials and lessons built into Algodoo to acquire the knowledge and skills needed to have a enjoyable experience building working machines and contraptions in Algodoo. I've decided to start building a library of Algodoo tutorials because I want learners of all ages to have the opportunity to take advantage of all of the features built into Algodoo. For example, to test the accuracy of the physics modeling in Algodoo, I decided to model a simple pendulum with a length of three meters. I would then measure the period of the Algodoo pendulum by timing (with my cell phone) 10 back-and-forth cycles and dividing that time by 10 to get the time (period) for one cycle. Watch this tutorial to learn how simple it is to model a pendulum in Algodoo. When I viewed many of the Algodoo YouTube videos I was impressed with the wide variety of shapes modelers used in building their contraptions. Watch this short tutorial to learn how easy it is to build a circular track for a marble to roll in. One of the mechanisms I saw on YouTube was a piston moving back and forth between two blocks. In this tutorial you will learn how to motorize an axle and how to use the add tool to make a connecting rod. 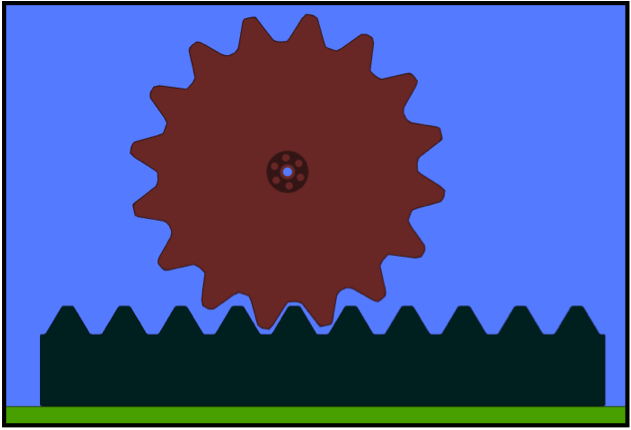 There is a gear tool in Algodoo and it it used to build a train of three gears. View this video to learn how it's done. Like you, I too am learning how to play in the Algodoo sandbox. Every time I have an idea for a new mechanism I have to figure out how to do it given the tools available in the program. For example, it's easy enough to understand how I used the gear tool to draw the rust-colored gear in the following picture. But how did I construct the bottom straight gear? To find out, click on the link below and go to a special site on Vimeo where all of the above tutorials and the tutorials done to date are stored, and click on the Rack and Pinion tutorial. A big thank you to the AIMS Education Foundation for hosting the Algodoo tutorials on Vimeo. Visit often to view the latest tutorials.